Kids' Caffeine Consumption - How Much Is Safe for My Child? Modern society’s obsession with caffeine is undeniable. It’s not just in our coffee anymore; food companies infuse this substance in various food and beverage products, including children’s snacks. And while consuming caffeine in moderation is safe and may be beneficial for adults, it’s entirely different when it comes to kids. If you’re wondering whether caffeine consumption is safe and healthy for your child, this guide may have the answers you are looking for. Why do parents allow their kids to consume caffeine? Is caffeine consumption safe and healthy for kids? How long does the effect of caffeine last? Is caffeine consumption linked to bedwetting in children? How much caffeine is safe for my child? What are the most common sources of caffeine in kids’ diets? Caffeine as a Treatment for ADD or ADHD? When a child consumes very high doses of caffeine, he may end up in serious medical danger. According to the American Association of Poison Control Centers, around 1,200 children below the age of 6 suffer from caffeine toxicity every year. Some of the adverse effects of excessive caffeine consumption include (1) tachycardia, (2) arrhythmia, (3) hypertension, (4) sleep disturbance, (5) hyperactivity, (6) heightened anxiety, and even (7) death. The main sources of caffeine in children’s diets are sodas, coffee, tea, and energy drinks [Source: AAP]. Various children’s snacks are infused with this psychoactive drug as well. Conclusions of various studies on the issue of using caffeine as treatment for ADD and ADHD have been mixed. It is not usually the recommended treatment for these mental disorders, especially for children. If you still insist on exploring the use of caffeine as an alternative treatment for your child, you must first consult with his doctor. Caffeine is a bitter-tasting substance that is naturally present in various plants, including but not limited to coffee beans, tea leaves, Kola nuts and cacao pods (Source: MedlinePlus). Therefore, it also found in various foods and beverages like coffee, tea, soft drinks, and chocolate bars. However, synthetic or man-made caffeine can also be found in several over-the-counter medications. It is a well-known and completely legal psychoactive drug that people ingest through what they eat or drink. To those who consume it knowingly, they do so because the caffeine helps them stay alert or perform optimally. This is one of the reasons why it is the most widely-consumed stimulant on the face of the Earth. Though people are indifferent about other people’s affinity for anything caffeinated, it’s an entirely different story when kids and adolescents are concerned. Parents, health professionals, and lawmakers are anxious about the potential adverse effects this supposedly “safe” substance may have on children. 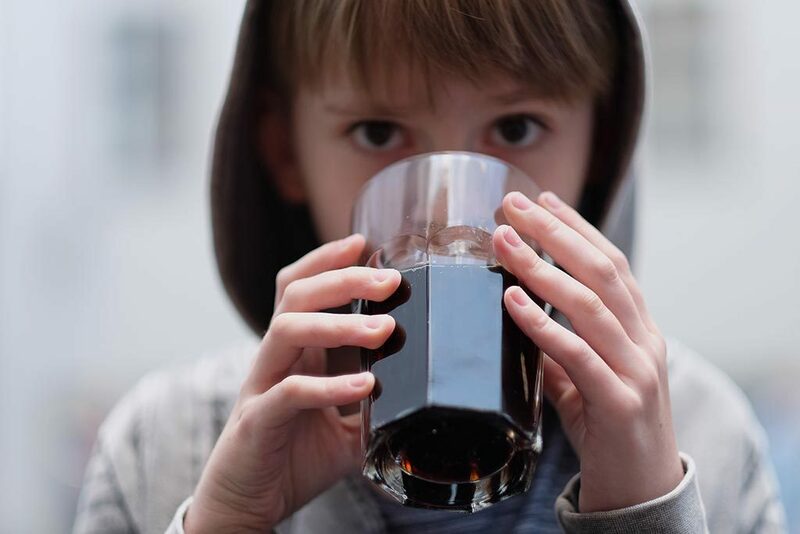 Such concerns are more than valid when, according to a study conducted by the American Academy of Pediatrics (AAP), about 73% of the children in the U.S. consume caffeine in a day. #1: Many parents are not aware that caffeine consumption among children is even a health issue. Nowadays, self-medicating with caffeine-infused beverages like coffee is the norm among adults. It’s a quick fix that would ensure that they can keep performing at their best. Caffeine not only increases their strength and endurance, it also delays their exhaustion and improves reaction time [Source: AAP Publications – Pediatrics]. Considering their personal experience with the benefits that consuming caffeine brings them, it comes as no surprise why some parents may have the impression that this substance might also be good for their kids. #2: Even if they are aware that the caffeine intake of their kids is a cause for concern, they don’t like having to confront their children about it. Plenty of the food and drinks that kids enjoy are infused with caffeine. And so, if you decide to start depriving them of their favorite soft drink or snack bar, it is highly likely that your good intentions might cause some friction between you and your child. #3: Parents don’t know which of the foods or beverages they buy for their children contain caffeine. Most people are very familiar with the traditional sources of caffeine (e.g., coffee, soda, etc.). But nowadays, other seemingly harmless food and beverage products (e.g., energy drinks and potato chips) contain caffeine, too. Therefore, try as they might, some parents wouldn’t be able to tell for certain if what they’re feeding their kids has caffeine in them unless the ingredient label of a food item says so. The positive and negative effects of caffeine intake for adults have been studied heavily. Research on the impact of this stimulant among children, however, is very scarce. Hence, there’s no definitive answer on whether it’s totally okay for them to ingest it. Nonetheless, the American Academy of Pediatrics has a firm position on this issue. For the organization, any drink containing this stimulant has “no place in the diets of children and adolescents [Source: AAP].” The Dietary Guidelines for Americans as well as the Institute Medicine do not consider caffeine as a nutrient either. Health professionals frown upon the idea of letting children freely consume caffeine-infused products. Therefore, the promise of increased alertness and delayed fatigue when ingesting caffeine is not a benefit that should apply to kids. Instead, parents should refrain from finding ways to justify their children’s caffeine intake and should educate themselves on the negative effects of this bitter stimulant. Since caffeine is a psychoactive drug, regularly ingesting it can get addictive. And so, if you ever decide to start depriving your child access to this stimulant, you can be sure that he won’t break the habit easily. Caffeine withdrawal is a difficult and unpleasant experience for adults, and you can only expect that children will go through the same thing. The effects of caffeine kick in as soon as it enters the bloodstream. This process usually takes 15 minutes after ingesting it. The body only expels the substance after 6 to 7 hours. Many blame caffeine intake as the main reason why kids wet the bed while sleeping. However, research has yet to show a clear link between caffeine and bedwetting. Currently, the U.S. government has yet to provide guidelines on the caffeine intake for kids. However, its northern neighbor, the Canadian government, has already set daily caffeine limits for Canadian parents to follow. In the past, the two main sources of caffeine in children’s diets are soda and tea. In fact, according to a study conducted by the American Academy of Pediatrics, 38% of the caffeine consumption in children are from soda. However, nowadays, fewer children regularly drink soda, and more kids are preferring to drink coffee (24%) and energy drinks (6%). Not only that, more and more of children’s snacks (e.g., potato chips, candy bars, gum, etc.) are now infused with caffeine. Usually, where there’s caffeine, there’s sugar. This is because sugar can mask or suppress the overwhelmingly bitter taste of caffeine, which, while preferred by some adults, is not enjoyed by most kids. Another reason that people tend to mix these two substances together is their beneficial effects on sustained attention and verbal memory, which is an edge that many adults require when working [Source: Human Psychopharmacology]. However, when abused, combining caffeine and sugar brings about devastating consequences to our well-being. In the case of children, the dangers outweigh the benefits so much that their exposure to the deadly combination of these two chemicals is highly objectionable for many parents. When your child consumes sugar and caffeine at the same time, his blood sugar levels shoot up, which makes him more energetic for a few hours. However, shortly thereafter, his blood sugar will crash, triggering cravings for more carbohydrates than his body’s actual calorie needs. As a consequence, this excessive sugar intake greatly imbalances your kid’s blood sugar levels and may lead him to have an overweight or obese body mass index (BMI). Attention-deficit disorder (ADD) and attention-deficit hyperactivity disorder (ADHD) are mental disorders that affect the ability of children to sustain their focus on their daily activities. These include but are not limited to dealing with schoolwork and interacting with other people. Both types of neurodevelopmental disorders are linked to symptoms like inattentiveness and distractibility. What makes children with ADHD different from ADD patients is that the former also show symptoms of hyperactivity as well as impulsivity. Aside from behavioral therapy, these mental health conditions are treated using drugs – stimulants in particular. Through stimulant therapy, children with ADD or ADHD can stay focused better and have longer attention spans. Medication also helps in managing their impulsive behavior. And because caffeine is a legal and widely used stimulant, many scientists have considered the possibility of using it as a viable treatment for ADD and ADHD. However, so far, the conclusions of various studies on this issue have been mixed [Source: WebMD]. Therefore, it is not usually the recommended treatment for these mental disorders, especially for children. Neither do experts recommend that you give your child caffeine when he’s already taking prescription medication. And even if high doses of caffeine can help in controlling your child’s hyperactivity, he might be vulnerable to its unpleasant side effects as well. Therefore, if you still insist on exploring the use of caffeine as an alternative treatment for your child, you must first consult with his doctor. Caffeine intake by drinking coffee or energy drinks is a common strategy for young students to perform better in school. Historically, people associate coffee or caffeine as an extra boost to make you work harder. However, coffee drinking or caffeine consumption is not just credited for students’ higher productivity. This habit is also positively correlated with nicotine and alcohol consumption and living a sedentary lifestyle (e.g., too much screen time by watching TV or playing video games all day) [Source: Precision Nutrition]. Therefore, it is very likely that many coffee-drinking young adults are also drinking alcohol, smoking, and are physically unfit. Moreover, a recent study on the behavior of rats suggests that consuming high doses of caffeine may be counterproductive for hard-working individuals. Instead of getting them to work harder, caffeine intake may only lessen the efforts or worsen the performance of originally-industrious students. The same study implied that consuming caffeine will not help slackers to do any better either [Source: Neuropsychopharmacology]. #1: Start cutting back your child’s caffeine consumption gradually. Otherwise, they may suffer from severe withdrawal symptoms like headaches, fatigue, drowsiness, muscle pain, and depressed mood. #2: Say goodbye to soda and energy drinks. For kids and teenagers (and even adults), water should be the primary source of hydration. You may also let them drink milk, flavored seltzer, or 100% fruit juice. If you really want to give them a glass of soda or a cup of tea once in a while, make sure you get him the decaffeinated one. #3: Check the ingredient list of food and beverage items before buying them. You may not realize that some of the food products you have at home have caffeine in them. #4: If your child starts to show signs of feeling tired, encourage them to sleep. Slowly cutting back your kid’s caffeine intake may deplete his energy levels in the beginning. However, sleeping and resting will surely replenish his energy reserves in just a matter of days. #5: Educate your kids about the dangers of unhealthy caffeine consumption and teach them ways to regulate their intake. At the end of the day, when it comes to consuming caffeine, moderation, if not complete avoidance, is key. Children don’t have the mindfulness and maturity that adults do. Therefore, it will be up to you as a parent to monitor your child’s caffeine intake. And, if necessary, you must slowly limit his consumption. Doing so will help ensure that your kid lives a safe, healthy, and contented life.